After reading a book at Michigan City High School about building a spaceship, E-Lexus Thornton decided that’s what he wanted to do in real life. “I majored in physics because I want to work for NASA someday,” he commented. He is the first in his family to pursue a college degree. After he graduates in May, E-Lexus plans to pursue a doctorate in mechanical engineering, bringing him closer to his goal to be a NASA scientist. When he arrived at IU South Bend, he felt underprepared for the rigors of pursuing an undergraduate degree in physics, especially in math. “The classes were harder than I expected, and I had to work two jobs,” he explained. 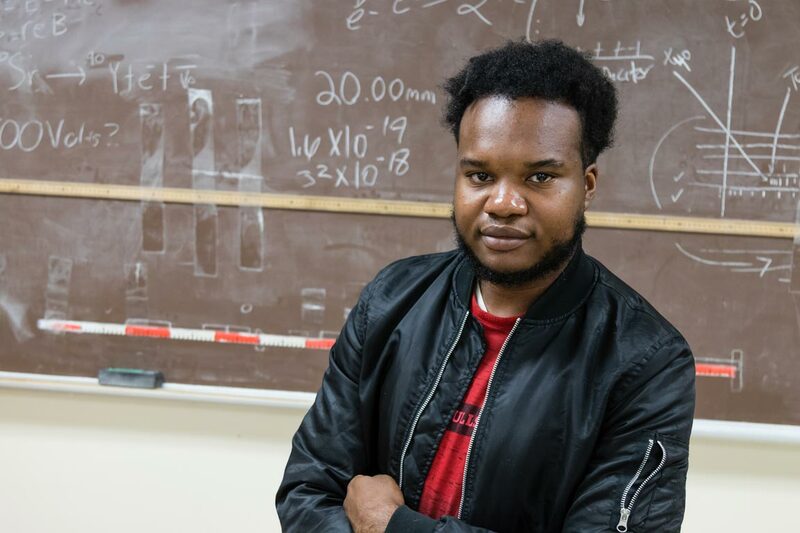 “But I am passionate about my goal to work for NASA, so I made the time to study harder and meet the challenges.” Today, he’s a peer mentor in physics. E-Lexus noted that his professors, especially Dr. Jerry Hinnefeld, have been very helpful throughout his tenure at IU South Bend. “Professor Hinnefeld was instrumental in getting me a paid summer internship working with him on a research project in the Accelerator Laboratory at Notre Dame,” he said. Last fall, E-Lexus was invited to present a poster about his summer research at the Conference Experience for Undergraduates at the fall meeting of the Division of Nuclear Physics of the American Physical Society in Pittsburg. In addition to devoting many hours to his academics, E-Lexus also tutors students in the subject of English at Harrison Primary Center. His experience as a tutor led him to become an advocate for students who are enrolled in South Bend Community School Corporation (SBCSC). “My tutoring was the reason I got into activism,” he said. “I wanted to do better for the kids.” He’s voiced his concerns at community forums and school board meetings about discipline policies he feels are not fair to minorities and a curriculum that does not teach students about black history. “These kids are not being taught about themselves,” he explained. At IU South Bend, E-Lexus is also the president of the Black Student Union, which raised funds to support SBCSC programs this year. He is also active in the Society of Physics.